This is a ride for cyclists of all levels, whether you want to push your endurance level or work together as a team the ultimate goal is to have an incredible weekend riding bikes and strengthening our community. PH24 is an event for anyone who wants to participate. You don’t need to be a rider to join in. Check out the ride route, call your neighbors, grab some lawn chairs and join us this August! This event is for people who enjoy cycling, want to push themselves, or just want to participate in an event that is like nothing else you have encountered. Even if you think you aren’t ready to ride for 24 hours, you can split it up with a team. There are also many opportunities to help other ways. Check our volunteer page. The Powderhorn 24 was inspired by the Riverwest 24 in Milwaukee, WI. These 24 hour events are a way for our neighborhoods to welcome new people, strengthen relationships within the community (and beyond), and show everyone why our community is amazing. From riders to volunteers, organizers to community sponsors, everyone brings a different talent and interest to the table. The ride starts at 7pm on Friday, August 2th, 2019 and ends the next day, Saturday the 3rd, at 7pm. The ride starts on the Midtown Greenway by the 10th Avenue Greenway exit, and goes in and around the Powderhorn neighborhood of Minneapolis. Registration will go live on May 1, 2019. It’ll be linked on this website and on the Powderhorn 24 Facebook page. Do I have to ride at all times for 24 hours? Absolutely not. Whether you are relaying as a team or riding solo, you can stop and rest at any time. In fact most people are riding for fun and to go to the bonus checkpoints. Can multiple riders from my team ride at the same time? Sure, but only one of you will be counted. Each team gets one manifest at a time, the rider that has the manifest in hand is the only rider that can score lap points. There are 4 checkpoints where riders get their manifest (‘card’) punched. There is only a suggested route, you are free to choose any route you like as long as you go to each checkpoint in order. You can see the suggested route here. Approx. 4.8 miles if you ride the suggested course. This does not include leaving the course for bonus checkpoints. What if I miss a checkpoint or didn’t get my card punched? We will not punch your manifest if the previous checkpoint is not punched. You must return to the checkpoint you missed and get it punched there. What happens if I lose my manifest? The laps on that manifest do not count. Only completed manifests are counted. The only exception is the manifest you turn in at the end of the event, that one does not need to be complete. If you do lose you manifest, come back to the Start/Finish line to get a new one. Bonus checkpoints are rotating locations in the neighborhood that riders can go to and receive extra points. They are optional (though strongly encouraged) and will be released the day of the event. The money you spend to register is used to make the event happen. It pays for your shirts, spoke cards, food, printing costs, web costs, port-o-potties, etc. Powderhorn 24 is a volunteer driven event and nobody keeps the money. If we can make this happen without spending any of our own money to support it, everyone is happy. New for 2018: $5 of each registration will be donated to FOR US, a collective of FTWs (Femme/Trans/Women) who self-identify as BIPOC+ (Black, Indigenous, People of Color) and those who have complicated relationship w their race who organize, support each other, center healing, and ride bikes. How do I find out the event details? You will receive an email confirming you signed up along with everything you will need to know for the event. If you did not get an email within a few days of the start, check with your team leader (not every team member left their email address) and if they didn’t get one contact us. 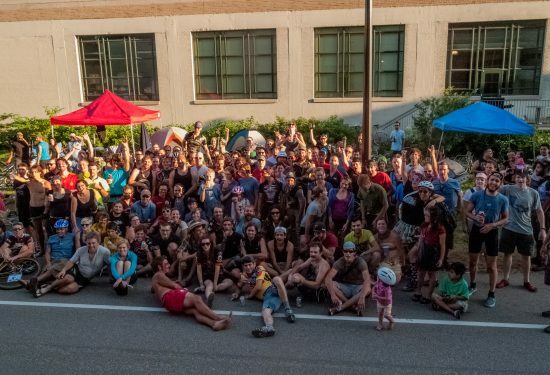 Subscribe to our newsletter to get all the information on becoming a rider, volunteering or supporting the Powderhorn 24 Community Ride! © 2019 Powderhorn 24 LLC.